Cinematographer Joe Cunningham was shocked when he came across this bad Businessweek ad, the weekly business magazine. It depicts a net, presumably from a tuna farm open ocean pen, and hails tuna farming as a terrific investment given the great worldwide demand for sushi. This is supposed to be a witty ad, but joking about tuna investments without considering the environmental consequences is uninformed. Tuna farming is one of the least sustainable forms of aquaculture there is. Why? 1- Because tuna eat a lot of fish. Even if they are fed fish meal, that feed is made from other fish, taken right out of the ocean. It takes 20 lbs of fish to produce one pound of tuna. Any feed not consumed by the farmed tuna that slips through the net is released into the open ocean, polluting the surrounding environment. 2- Farmed tuna are just young wild tuna taken out of the ocean to fatten up in pens. This means that immature tuna are being taken out of the wild stocks before they get a chance to spawn, further decreasing wild stocks. These fish are already endangered . 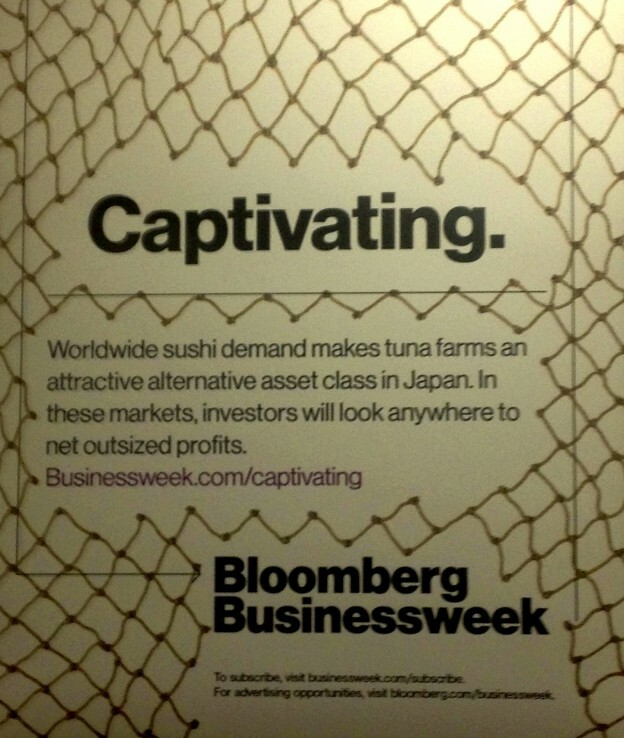 Why couldn’t Businessweek look to other ways to invest in the world’s appetite for fish? Eating fish lower on the food chain, for example. Like progressive farms like TwoXSea that farms vegetarian trout? Or how about investing in some oyster farms? If you follow the link in the ad, you learn that you could get 7% return on your investment. We have another figure for you: 96.4%. That’s how much the Pacific bluefin tuna population has been decimated since mankind developed an appetite for them. Perhaps investors need to look elsewhere.